We are proud to present this great opportunity to own an established bar & restaurant with a Full type 47 hard Liqour license. 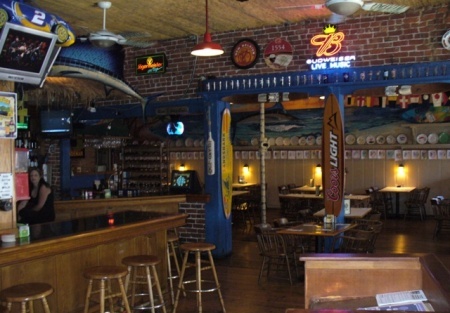 The atmosphere is unique within a casual sports and entertainment oriented Restaurant and Bar. The business has been in operation since 1998 and the current owners own the building as well, so he has a vested interest in your success by placing the rent at the low monthly rate of $3,500, and that includes NNN costs. Let's do the math...that's $0.70 per sq. ft. for this 5,000 Sq. Ft. building! Ouch! Steal this baby from the landlord. Wait a minute...Steal the whole Operation! The owner wants to offer a Great Deal on the additional 5,000 SQF. upstairs Bar/Nightclub! for a Total of 10,000 sqf.. This space is already and setup for live music, large parties, comedy nights, Catered events...you name it. The current license covers the upstairs Bar, so it's all ready to make money and currently has a large Bar,Huge dance floor,Super sized Big screens and a stage for live music. You can have it all for $229,000....make an Offer he can't refuse before it's gone. $5,900 rent for the entire 10,000 sqf. That's only .59 cents a sqf. !!!! For 12 years, this restaurant has been the favorite place to wind down for the locals with 16 beers on tap and 10 straight from the bottle, as well as the best-stocked liquor selection in town. And as for entertainment, this is the city's favorite karaoke spot and they aslo have Live DJ and dancing on Friday and Saturday nights to get those sales cranking. The food served - and you can obviously change the menu if you like -is Hot Wings, which is there signature dish, Salads, Burgers, Pizza, Sandwiches, and more! All easy things to make and with great margins as well. They also serve steaks for those meat eaters in the area. The owners can boast winning Best Place to Dance, Best Place to Meet Singles and Best Bar/Pub...having won 11 awards so far. This owner has plugged this restaurant into the community by doing wonderful community service activities such as "Feed the Need" and other charitable events in the area. This is a fun business to run, but like any restaurant it can be hard work, but very rewarding work as well. "Owner says lets find a Qualified Operator and He will carry a note for part of the purchase price....How much depends on the buyers experience, credit and financials....Time to make an offer before he changes his mind!" Recently the city renovated the Grand Theatre across the street which enhaces the traffic in the area. Owner will carry a portion of the sales price for a qualified operator.